Hello, Dolly: Sisters Dolly (Stacy Ross, left) and Esther (Lanie MacEwan) agree to disagree. IN ITS usual grand scale, TheatreWorks, with scenic designer Andrea Bechert, has created a beautiful set design for the American debut of Dolly West's Kitchen, a play by Frank McGuinness. Set in Ireland during World War II, the elaborate rock-walled garden framing a huge cutaway house projects the relative comfort of the West family's lifestyle, the mystique of Ireland and the "simpler times" we tend to envision as the 1940s. And the set made McGuinness' varied, simultaneous action work. 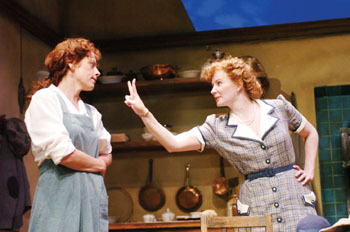 For example, as a separate lighting zone with two wall lamps that came up cozily at night (lighting designer Pamila Gray), the family dining room features banter between matriarch Rima West (Charlotte Cornwell) and her son-in-law, Ned (Simon Vance), while outside in twilight among the rocks, Dolly (Stacy Ross) and her sister, Esther (Lanie MacEwan), converse privately to the distant sound of the sea (Cliff Caruthers, sound design). When the play starts out, Rima West is a tipsy older woman, her maid, Anna (Desirée Matthews), is a young innocent and her son, Justin (Jeremy Bobb), is the blustering man of the house, but as things unravel, no one turns out to be as they first seem (except maybe Dolly, whose constancy, perhaps, makes her the title character). Rima stirs things up for her family by inviting two American soldiers into her Donegal home. (They're stationed across the border in British controlled Northern Ireland, which, unlike neutral Ireland, fought in the war.) When Dolly's love interest, a British soldier, comes to pay a visit, the tension is complete. But really the play is less about history and war (though the mini-Irish history lesson in the program notes is helpful) than about seething life under the surface of things and the uncharted wilds we're led to by our choices. Between history, emotional issues and abundant character development (there aren't really any "minor" roles), this play is a juggling act that makes it easy to drop a ball or two. The parade of new revelations about each character requires a depth of performance (to embody the seeds of future selves in early scenes) that doesn't always happen. As a result, a character may seem to be redefined retroactively. In a priceless performance, Charlotte Cornwell plays the central (though not the title) character, Rima West, a role obviously written from inspiration. When Rima speaks, the colorful language comes out: "Shite flies high when it's hit with a stick." McGuinness invests his finest complexities in Rima. And Cornwell captures Rima in all her wise and nasty glory, bringing us just the sort of person who spits out affection on the tip of a crass insult and whose will can be respected even as her drunkenness is coddled. So when Rima goes out of it, the show sags. Without her, the denouement (or various denouements of the four couples' lives) totters ever closer to melodrama. And in some scenes the set design starts to look ever more fascinatingwhich brings us full circle. Though Dolly West's Kitchen doesn't always have that everything-clicks kind of unity, it's a grand production, and it puts a lot of rugged, emotional fare on your plate with never a dull moment.